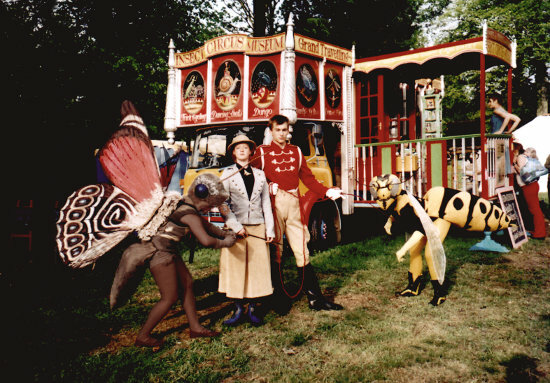 Mark and his partner Sarah Munro got hold of an old horse box and started turning it into an old-style circus caravan, some of the ‘curly front bits’ recycled from the set of Gormenghast. Inside, the walls are covered in posters and hold circus relics in glass display cases—there’s an especially good case which is all about ‘The Peaple’, a Liverpool-based bug band. At child level there are push-button mechanical models which animate some of the scenes from the paintings, and which Mark says were inspired partly by the Cabaret Mechanical Theatre that used to be in Covent Garden. Interview with Mark Copeland conducted 20 June 2009 at The Big Event in Myatt's Fields Park, Camberwell.